The Big Four . . . Coming To A Theatre Near You! Can't make it to Europe this June for one of the seven Sonisphere "Big Four" shows featuring us along with Slayer, Megadeth, and Anthrax? No problem . . . we've got the next best thing through the magic of satellite technology with a special HD simulcast from Sofia, Bulgaria on June 22! No, unfortunately each band's entire set will not be shown, but trust us, you'll see most of the action. "We know, we know . . . it has been WAY too long since we visited this part of the world, but we're here to tell you that it is game on!!!! We can't wait to head over to New Zealand and many parts of Australia bringing the World Magnetic Tour to places it has not rocked yet. 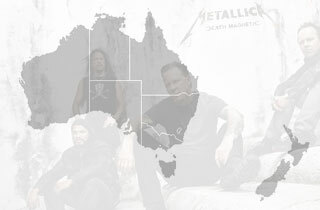 Starting October 13, 2010 in Auckland, NZ, we'll also be in Brisbane, Perth, Sydney, Adelaide, and Melbourne . . . dates and venues are below." We look forward to seeing all our friends there who have patiently (or maybe not so patiently!) waitedover six years!!! 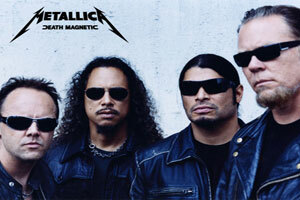 Metallica has added two dates for their upcoming European leg, including another "big four" gig. James will be showing off a car of his at this.